Along with the garden, a prospective buyer needs to know what the other responsibilities entail. Number One: FEED THE BIRDS. 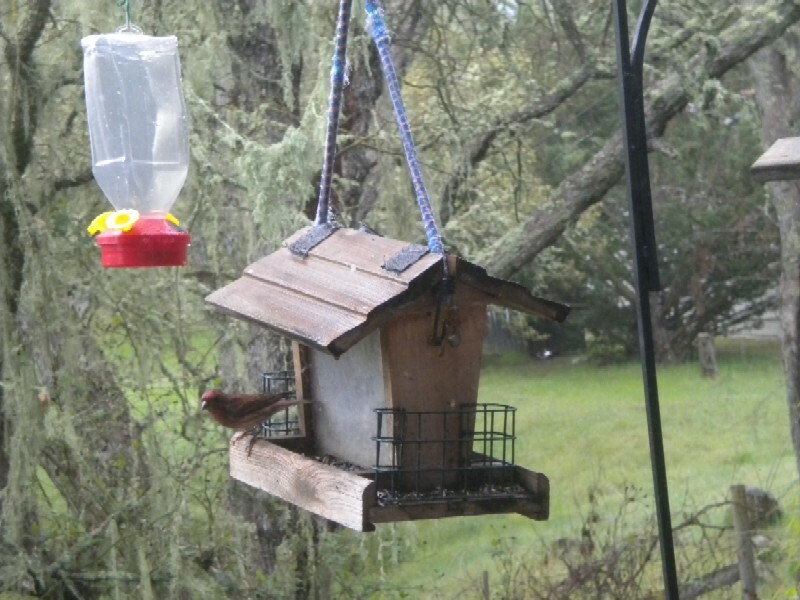 We call Castenada Lane the Bird Sanctuary because we have set up multiple feeders, utilizing sunflower seeds, thistle, mixed seed , suet and peanuts and have a number of bird “drips” which they especially love. Our birds have a good home. It is theirs. In the front of my Audubon Field Guide I have scribbled the names of 42 species I have identified from my cozy nook on the window seat without even leaving the house. Some of them, like the Black Headed Grosbeak and the Violet Green Swallow are visitors, passing through once a year. Most of them are regular residents, in particular the acorn and Nuttal woodpeckers, the California scrub jay, the house finch and the golden finch, the oak titmouse and the white breasted nuthatch, the western bluebird, the California towhee and the western junco, to name a few. Those are the birds we feed. Not to mention the hummers who need their feeders regularly washed with soap and water, filled with sugar water and NO RED FOOD DYE. They know where to go. And the jays are ready and waiting for peanuts on the railing outside the kitchen at just the time they hear the coffee grinder in the morning. Also in residence I should mention the curious Great Horned Owl who echos our hoo, hoo-hoo, hoo, hoo’s and the red shouldered hawk, who screams on high and occasionally sits upon the horizontal oak branch in the lower field. But they pick up the tab for their meals – probably small furry creatures which we do NOT provide at our feeders. The wild turkey is NOT indigenous and remains a story for another day. So Prospective Buyer – you must feed the birds. Number two: and this is the most important requirement. Button. She is the perfectly beautiful calico feral cat who comes to the side deck to be fed. We captured her seven years ago and had her fixed. She is the BEST gopher catcher in the state of California, so she needs to be appreciated. However, she likes her breakfast at 7 a.m. and her dinner between 4 and 5 p.m. please, and it should consist of lightly cooked chicken, chopped and mixed with a combination of oatmeal, peas, bone meal, brewer’s yeast, taurine and fish oil. An occasional whipped egg yolk or a chicken neck or giblets is good too. So it is rather important that you not have a dog or a mean cat, for this is her yard and we cannot capture her again to take her with us to Minnesota. And because she doesn’t want to come inside, the snow would be inconvenient. She has a lovely bed here under the house. Love her and look after her, or you may not buy the house. Period. This entry was posted in Birds, Cats. Bookmark the permalink.